American students concert at the University Church St. Mary the Virgin, Oxford University, August 2004. 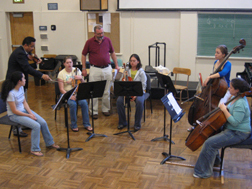 American and British students in a Masterclass with violinist Zak Graffilo and cellist Sandy Walsh-Wilson of the renowned Alexander Quartet, at San Francisco State University School of Music and Dance, International Youth Music Festival, August 2006. 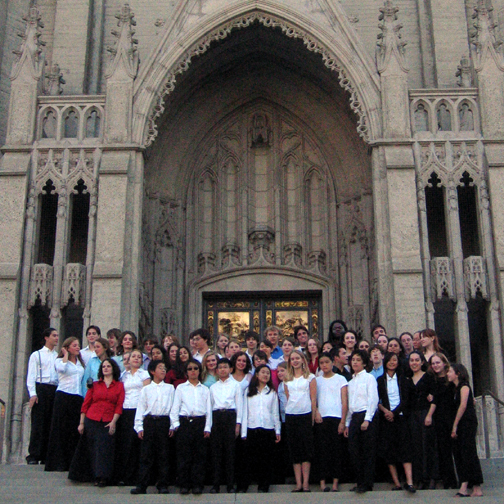 British and American students from the First International Youth Music Festival in front of Grace Cathedral, Nob Hill, San Francisco, August 2006. Youth Music International is a non-profit organization which believes in creating the most fertile environment for musical inspiration by establishing unique collaborations between exceptional and gifted young musicians from different countries. Combined with an eminent international faculty, and the ideal, intimate medium of chamber music, students prepare dynamic programs in a setting of inspirational architectural and historic beauty. Bringing together such gifted young talent from differing cultural backgrounds, perspectives and insights creates a rich, inspiring atmosphere and a mutual enrichment of cultures which permanently expands creative vision and immerses students, faculty and audiences in an unforgettable musical experience. The idea of Youth Music International (formerly the British and American Chamber Music Exchange), began in 2003 when director, Erika Miranda, first brought a handful of talented young Americans to work with a chamber course in Oxford. After that the B&ACME was born and transformed into Youth Music International Since then, YouMI has taken students to London, Oxford and Bath as well as invited British students and others to the US. 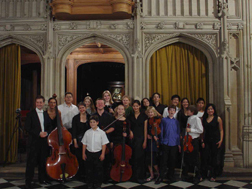 In 2007, Youth Music International will return to Oxford with many new members from both the US and UK and will expand to include other countries in 2008.